Amazon announced 20 finalists in the United States and Canada to host its second headquarters on Thursday. The new facility -- called HQ2 -- will cost at least $5 billion to construct and operate, and it will create as many as 50,000 jobs. Last year, the company received bids from 238 cities and regions in 54 states, provinces, districts and territories across North America. Amazon said it will make a decision this year. Toronto is the only city outside the U.S. still in the running, and Amazon chose three locations in the Washington metro area. Overall, the final contenders didn't surprise experts. "This is a very predictable list," said Joseph Parilla, a fellow at the Brookings Institution's Metropolitan Policy Program. "Geographically, only Los Angeles is represented from the West Coast, which makes sense." Analysts didn't expect Amazon to pick a location on the West Coast because its current headquarters is in Seattle. "We are excited to learn that Atlanta has been included on Amazon's short list," Georgia Governor Nathan Deal said in a tweet. "This has been a cooperative effort by the entire region, and we truly believe that Metro Atlanta has the talent, transit and logistics that provides the best location for Amazon's second headquarters." "I'm thrilled to see that Amazon has included both Austin and Dallas as finalists for its forthcoming HQ2," said Texas Governor Greg Abbott in a statement. 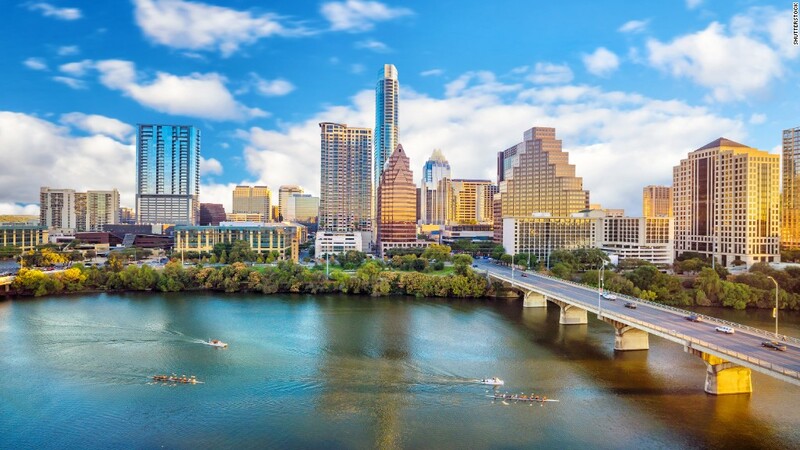 "Texas is a hotbed for the tech industry, and both Austin and Dallas have proven themselves to be among the most sought after locations for companies looking to grow and thrive." Austin, which is the home to Amazon-owned Whole Foods, has a booming tech sector. Tech companies like Apple, Google, Facebook and Microsoft all have offices there. There are 425,000 college students in the region, according to the Austin Chamber of Commerce, which would give Amazon a strong base for recruiting new employees. Companies such as General Electric (GE) and cybersecurity solutions firm iboss have moved their corporate headquarters to Boston in recent years -- and the city has been willing to offer tax breaks. For example, GE's move to Boston came with $150 million in government incentives. "As a thriving city with a talented and diverse workforce, culture of innovation and opportunity for all, I see no better city than Boston for Amazon to call their second home," Mayor Marty Walsh said in a statement. Boeing and United are among the top companies who've already set up shop in the Windy City. McDonald's is also moving its headquarters to Chicago this year. "Today's news makes clear that Amazon recognizes Chicago's great strengths - access to talent, transportation, higher education, affordability and quality of life, which are the keys to growth and prosperity," Chicago Mayor Rahm Emanuel said in a statement to CNN Tech. Ohio's capital city is home to 45,000 students at Ohio State University. Columbus offered Amazon a 15-year full property tax abatement, income tax refunds, and investments in transportation, education and workforce developments in a letter obtained by the Columbus Dispatch. The city has an emerging startup scene and became the nation's first "Smart City" under the Obama administration. "Amazon recognizes what we already know — America's opportunity city would provide an excellent home for Amazon," Columbus Mayor Andrew Ginther said in a statement. The bid from the Dallas metro area came from the Dallas Regional Chamber and the Fort Worth Chamber, which said they are "pleased" to be on Amazon's short list. "One of the most compelling aspects of our proposal was the diversity of options we offer as a regional hub of economic development," said Brandom Gengelbach, executive vice president of economic development for the Fort Worth Chamber. Dallas and Fort Worth were on real estate group CBRE's rankings of the geographic locations with the most tech talent in 2017. The cost of living is also significantly lower than other tech hubs like San Francisco and New York City. The city that wins Amazon's second headquarters can expect housing prices, along with other costs of living, to rise. However, the impact would be lower in Dallas due to its lax building restrictions and a cheaper labor pool, according to research from Apartment List, which catalogs apartment rentals across the country. Denver, which is an emerging tech hub, has the fifth busiest airport with the third-largest domestic air service network in the United States. One of Amazon's criteria was proximity to a major airport. "It's great to be on Amazon's list of finalists as they consider the location of their second headquarters," said Colorado Governor John Hickenlooper. "Colorado is one of the most business-friendly states in America and we believe the Denver region would be a great choice for Amazon." Indianapolis submitted a joint bid with the suburban Fishers area. It has stayed mum on details of its proposal. The city is a growing tech area with Salesforce expanding its presence. Four Indiana cities bid for Amazon's HQ2. Los Angeles was the only city on the West Coast chosen for the list. The Los Angeles County Economic Development Corp. led the city's bid. Tax breaks and incentives were kept under wraps. "We've got rockets and rock stars, more engineers and more sunshine. The Olympics, two NFL teams, and George Lucas all know L.A. is the future — so should Amazon. And we love that Jeff Bezos already has a home here," LA Mayor Eric Garcetti told CNN Tech in a statement. Broward, Miami-Dade and Palm Beach counties spearheaded Miami's efforts to land HQ2. Details of South Florida's bid aren't widely known, but Miami's vibrant Latino community is likely to appeal to Amazon. "Miami's diversity would be an asset to Amazon, as the company would have access to our highly-skilled, multilingual workers, who have the talent necessary to focus on software development and related tech fields," Miami Mayor Francis Suarez told CNN Tech in a statement. Suarez said he reached out to Bezos after the announcement. Miami-Dade County Chairman Esteban "Steve" Bovo, however, thinks Amazon won't choose Miami because of transportation problems. "We're not equipped to draw 50,000 new jobs in here," he said in November. The Nashville Area Chamber of Commerce guided the city's efforts for Amazon. "We are excited to have made Amazon's top 20 list for a second headquarters," Nashville Mayor Megan Barry said in a statement to CNN Tech. "I'm confident that our socially progressive, pro-business climate, talented workforce, and overall great quality of life offer the type of environment that they are looking for in the city they'll choose." Colin Sebastian, an analyst at Baird, told CNN Tech he was surprised that cities such as Nashville and Columbus -- which do not have major airport hubs -- made it on the short list. "We're excited to be one step closer to landing the 50,000 good-paying jobs in Amazon's HQ2. No city in the world has the talent New York City can offer!" Mayor Bill de Blasio tweeted. New York proposed four business districts for the new site: Midtown West, Long Island City, Brooklyn Tech Triangle and Lower Manhattan. But Amazon shouldn't count on additional tax incentives from the city. "There are some state subsidies that are available. There are some specific things by law that anyone would be allowed to tap into, but we will not provide the traditional add-on economic subsidies, that's not something we believe in," de Blasio told reporters last year. Separately, Newark Mayor Ras Baraka called being selected on the short list a "great victory" for the city. It submitted a separate bid than New York City. "It means that world-class corporations and organizations like Amazon have recognized the success of our administration's efforts to build a stronger city that welcomes business, is open to innovation, and at the cutting edge of technology and transportation," Baraka said in a statement. The state of New Jersey and the city of Newark have collectively offered Amazon up to $7 billion in tax incentives, as part of a package which was signed into law by the state's governor last week. Philadelphia Mayor Jim Kenney said being on the short list was an "exciting milestone" for the city. "We are thrilled at today's announcement, and look forward to working with Amazon's team on the next steps of this process to further highlight all that Philadelphia has to offer," he said in a statement. A spokesperson for the city of Philadelphia said the tax incentives it offered Amazon would not be released at this time. Many cities are keeping such details secret in order to maintain a competitive bid. Pittsburgh would be able to offer Amazon tech talent from Carnegie Mellon University and the University of Pittsburgh, which has a computer science department. "It is no surprise that Pennsylvania's two world-class cities have made the shortlist for Amazon's HQ2," Pennsylvania Governor Tom Wolf said in a statement. "Pennsylvania's strategic location in the heart of the East Coast, nationally ranked educational institutions, and a workforce equipped to support future growth makes it prime for Amazon's second headquarters in North America." Duke Blue Devils and North Carolina Tar Heels fans can agree on one thing: Both want Amazon. The Raleigh area boasts Duke, North Carolina at Chapel Hill and North Carolina State University, a region known as the Research Triangle. "We are proud of the investments and partnerships we've made that enhance our many attributes, such as our world-class university system, well-trained workforce, diverse economy, strong infrastructure, and emerging entrepreneurial spirit," Raleigh Mayor Mayor Nancy McFarlane said in a statement. Toronto Global, the group which prepared the bid for Amazon's HQ2, said it was "honored" to be the only Canadian location on the short list. "From a future-proofed talent pipeline, to universal health care and benefits, to an incredibly cost competitive business climate, the Toronto Region is the location that addresses all of Amazon's needs," the investment attraction agency said in a statement. A spokeswoman for the group said Toronto did not offer any tax incentives as part of its HQ2 bid. She noted that the company stands to save up to $600 million per year due to Canada's universal healthcare. Washington Mayor Muriel Bowser said being selected for HQ2 -- and the 50,000 jobs that come with it -- would be a "win" for the city's residents. "Making this list reaffirms what we already knew going into the bid process -- Washington D.C. is no longer a one-company government town, we are a leader in innovation and tech, brimming with top talent and endless opportunity," she said in a statement. The Washington suburbs could also be an attractive place to put Amazon's second headquarters. The separate Northern Virginia proposal included four sites in Alexandria, Arlington, Fairfax and Loudoun counties, home to thousands of government workers and dozens of federal agencies. Northern Virginia is one of the wealthiest areas in the country and 11 Fortune 500 companies are located there. "Virginia's outstanding business climate and world-class workforce make our Commonwealth the right place for Amazon to place this key base of operations," Gov. Ralph Northam said in a statement. In addition, Montgomery County, Maryland, is also a contender from the area. It includes Bethesda and Silver Spring and is the only county on the list of finalists. Some of America's biggest companies, including Lockheed Martin and Marriott, and federal agencies are headquartered in Bethesda. Maryland Governor Larry Hogan called Amazon's announcement "tremendous news." Although Baltimore, where Under Armour is headquartered, didn't make the cut, Maryland proposed sites and incentive packages throughout the state totaling $5 billion. Hogan said Maryland will do "everything possible to bring this project home." CNNMoney's Tami Luhby contributed reporting to this article.